ISLAMABAD – A 13-year-old Pakistani student, Moosa Feroz, has secured first position in online World Mathematics Competition held in Australia, reported a private TV channel on Sunday. Feroz, resident of Punjab city of Phalia and a student of Beaconhouse School System, was awarded gold medal in Australia recently. Feroz was among 4405 students who took the exam. 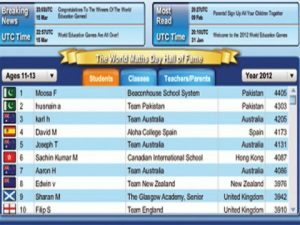 Another Pakistani student Hasnain got second position in the competition with 4303 points in 11-13 years age category. In a category of age 14-18 years, another Pakistani student named Osama secured second place with 3318 points. About 1.57 million students from all over the world participated in the competition. Meanwhile, Punjab Chief Minister Shahbaz Sharif congratulated Musa Feroz on his marvelous achievement by getting first position in the international competition of mathematics. The Chief Minister said the young student has proved that the Pakistani children were more talented than other children of the world. He said every Pakistani was proud of this brilliant student belonging to Phalia, a backward area of the Punjab by winning 1st position. Shahbaz further stated that winning first position by a Pakistani student out of 15,0000 children of 100 countries was a great honour for Pakistani nation. He said presence of such youth was reflective of the fact that future of Pakistan was bright. In Pakistan we need to promote reading habbits and have books easily accesible to the audience anywhere in Pakistan and now we have companies like http://www.786cart.com who have a solution to this problem.